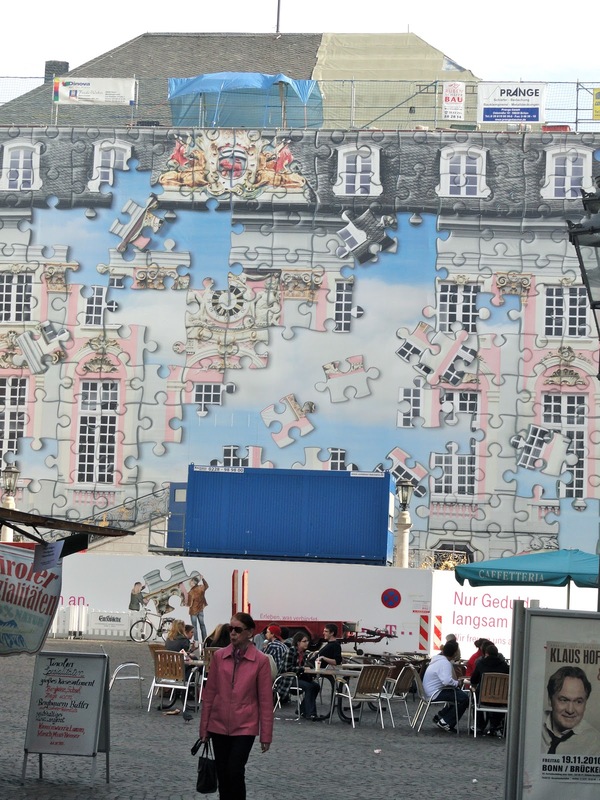 Koenigswinter may be the most visited German town you've never heard of. 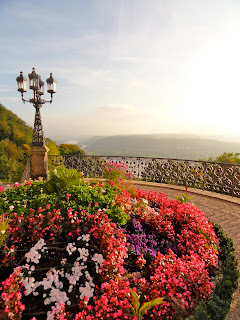 Rhine cruisers - day trippers (it's 50 minutes from Bonn by boat) or lengthy excursionists - stop here at the foot of the Drachenfels (Dragon) Mountain. Legends of dragons and knights were the draw for Lord Byron and other romantics. The Counts of Drachenfels sported a winged, fire breathing dragon in their coats of arms and Siegfried is supposed to have slain the dragon which lived in a cave on the hillside. Today, the castle is in ruins and the only dragons you are likely to see will be in logos and on shop signs. As you walk from the ferry dock up into the quaint medieval town (you leave "flat and level" with the river) look down at the entrances of houses and shops. The occupations of the original inhabitants are indicated by picturesque tiles. The "castle" most Koenigswinter tourists visit was neither a stronghold nor even lived in. 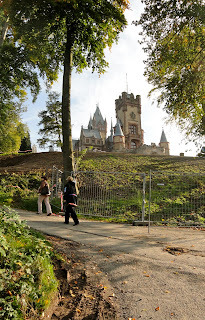 Schloss Drachenburg, halfway up the mountain, was the Gothic fantasy status symbol of Stephen Sarter, who had been born into a middle class Bonn family of hotel keepers and made his fortune in the Paris stock market. Status and image in the land of his birth were all for Sarter, who glorified himself and the former glory of Germany at the same time. He started his castle in 1882 and was made a baron in 1881 by Duke George von Saxony-Meiningen after a payment of 40,000 gold marks. Sarter, who became a French citizen and died in a tiny Paris apartment in 1902, never lived in his castle although he was buried in Koenigswinter below his folly. His nephew allowed guided tours of the castle, the Roman Catholic church ran a boarding school on the grounds and the Adolf Hitler School took over in 1940. 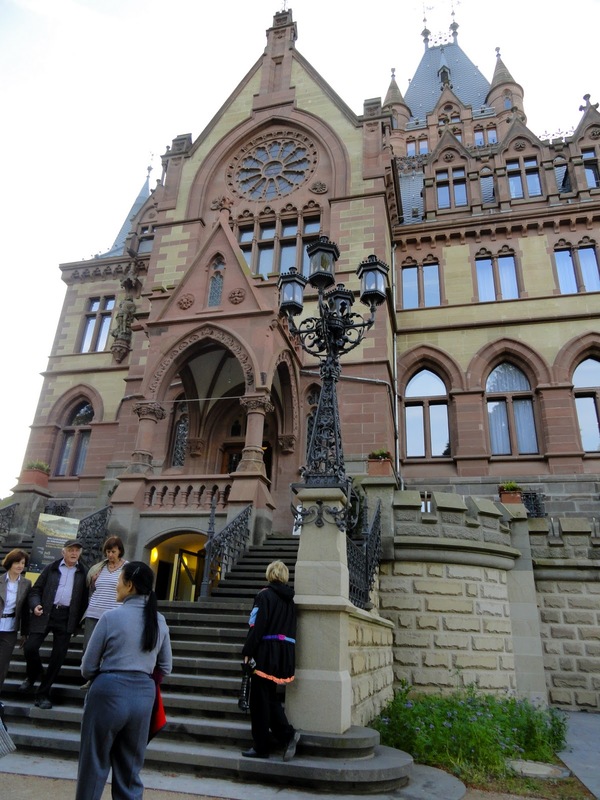 Now owned by a North Rhine-Westphalia foundation for preservation of local monuments, it is again a tourist attraction. 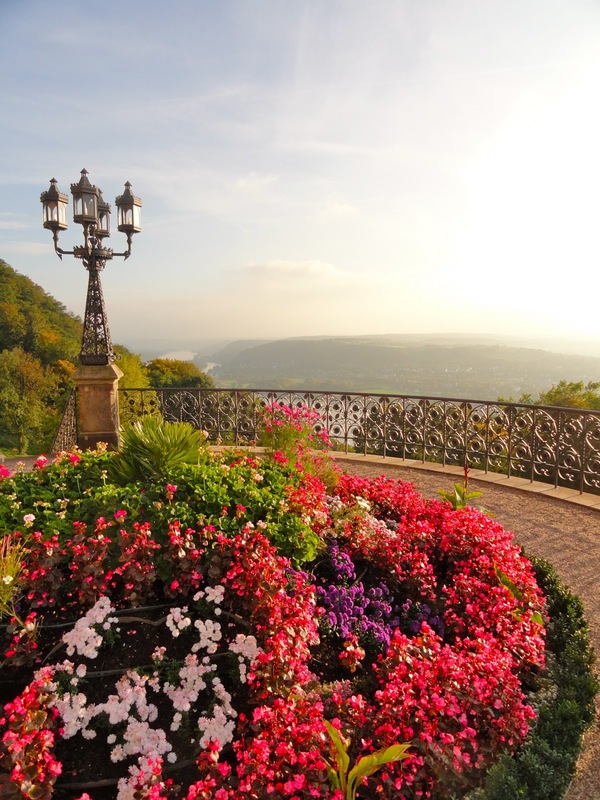 The views of the Rhine from the terrace are stunning, the tour of the castle's interior is interesting and the grounds are lovely. Warning: Getting there is a hike, with steep hills and lots of steps. The Drachenfels Rail, a rack railway and the oldest mountain railway in Germany, will take you most of the way. but you will have a steep hill and 17 steps to reach the station. 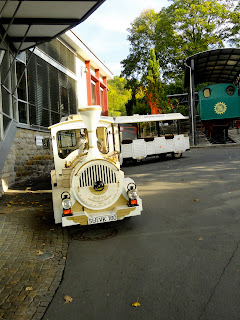 Tip: A little train will take you from the Rhine to the 17 steps up to the station; it runs every 30 minutes or so. Warning: Once you arrive at the rail's terminus, you will have 37 steps up, another short hill and 22 more steps to reach the castle's main level. Once there you have 11 steps to the first floor entrance and 34 steps to the second floor. Tip: There is a lift and by spring of 2011, improvements should cut out the first 37 steps from the train. 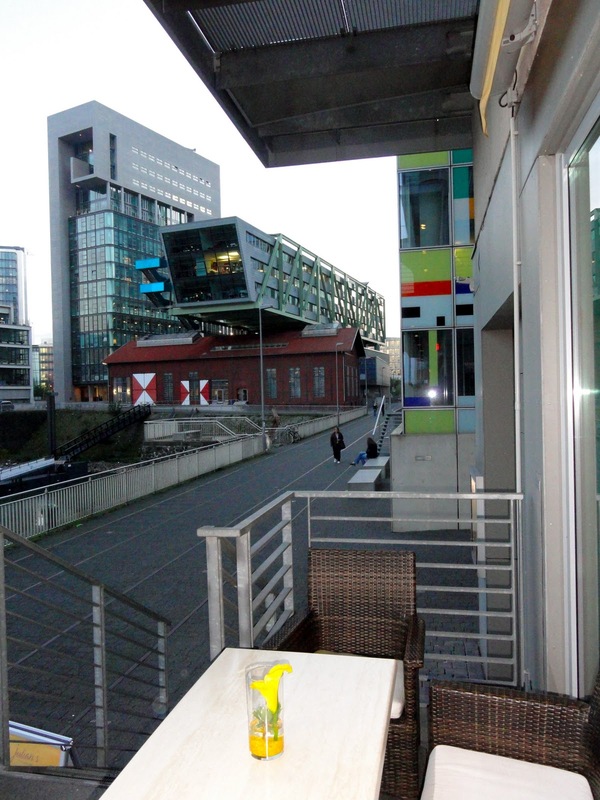 You might prefer watching traffic along the Rhine from the terrace at the Maritim Hotel Koenigswinter. The adjacent bar is a great place to snug in with an adult beverage if the weather turns wet or chilly. Whew. Just returned from a whirlwind trip to Playa del Carmen and Cancun, Mexico and at the moment, the frustrations of flying are stronger than the memories of beautiful surroundings and fun friends. Given my Jacksonville, FL, home base, Miami International Airport is a frequent gateway. The good news is the American Airlines terminal is finally in operation. The bad news is that whomever designed its connection to passport control and customs, also a bit rearranged, must never have flown internationally. It's a mess in which you find yourself walking endless corridors and negotiating a number of escalators to reach passport control. Then, having gone through that you have to circle around and cross through those coming in, take an escalator down to baggage claim where you are immediately dumped into milling crowds trying to retrieve bags. Try finding your way to the exit through that! It is particularly frustrating if you have no checked luggage; there is no direct way to avoid those who didn't pack light. Then it's following different colored dots on the floor and, if connecting with another flight, going through security again. Tips: If you have any trouble walking, ask for assistance when flying internationally through Miami. You'll never make it otherwise. Unless you are a world-class sprinter, you'll never make the average one-hour-long gap between connection if you have to switch terminals or go through customs. Insist on at least two hours between flights. If you are flying this holiday season, count on full flights, crowded airports and hunts for free tables in the food courts not unlike the hunt for parking. Not all is bad, however. 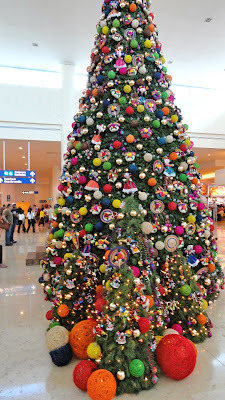 Some airports are festive and fun. Cancun's facility had spectacular trees covered in colorful Mexican hand-crafted ornaments and a "delegation" of angel (or Mary and Joseph, I couldn't be sure), two devils in horns and red devil suits and a Santa Claus wandering around. Combine that with the "Let's keep the party going" atmosphere in the large and open Margaritaville and you can have a jolly good time. Warning: Mexican security is capriciously serious about the 3 1/2-ounce limit on liquids. My searcher took exception to the almost empty 4-ounce bottle of contact lens solution but let pass a larger bottle of perfume. Guess he didn't want to tempt an international incident. Kudos to Jacksonville International Airport, too. Decorated trees are everywhere and each one is done by a different group: there's a contest to see which is most popular. The raise-your-hands-and let-the scan-reader-see-your-altogether machines are installed in Jacksonville, which pretty much eliminate pat-downs, a boon for those of us with joint replacements. Not so Miami although TSA staff is professional and thoughtful. Still a frustrating hassle. In short, forget that extra shirt. Pack your patience and sense of humor instead. Let me know what you encounter. Which is your favorite airport when returning from abroad? Bonn, Germany, has a lot going for it as Beethoven's home, as a busy stop on the Rhine and as a vibrant city. 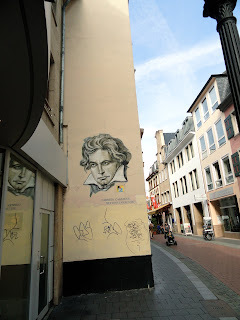 Too bad my visit was such a fleeting one all we could do was lunch, walk to the house Beethoven was born in and hurry through the town center to catch a ferry across and down the Rhine to Koenigswinter. From its beginnings as a Roman camp in the second century, Bonn became the residence of the Princes Elector of Cologne, a romantic university town and, following the massive destruction of World War II, the Federal Capitol of West Germany. 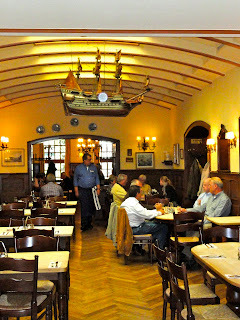 Lunch was at Brauhaus Boennsch at Sterntorbrucke 4, where we had an excellent meal and some of the very good Bonn beer. Tip: Restrooms are down 15 steps from the dining room. 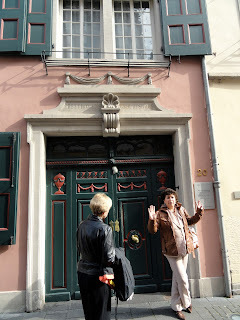 Then it was off to old town and Beethoven's birthplace in December, 1717. Many tourists walk by, take a picture and assume they have seen Beethovenhaus. Not. 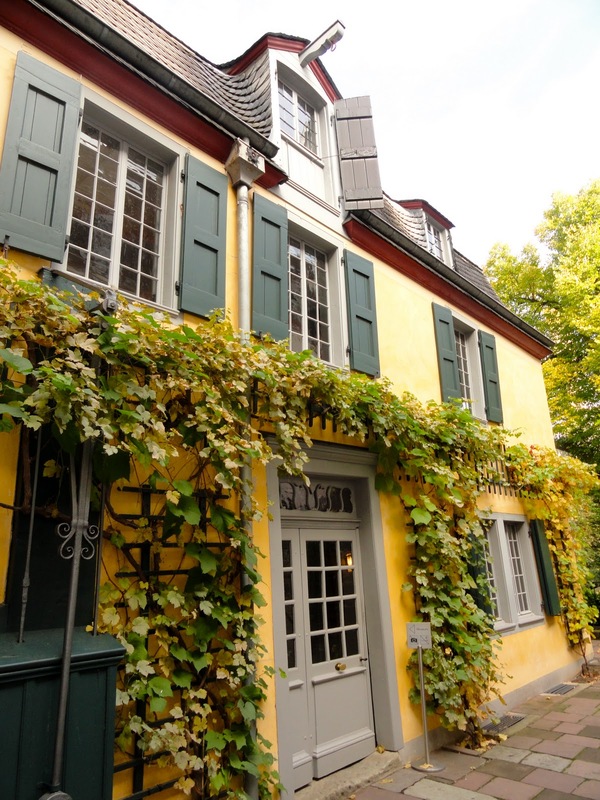 Beethoven's family lived in the much smaller house in the courtyard. 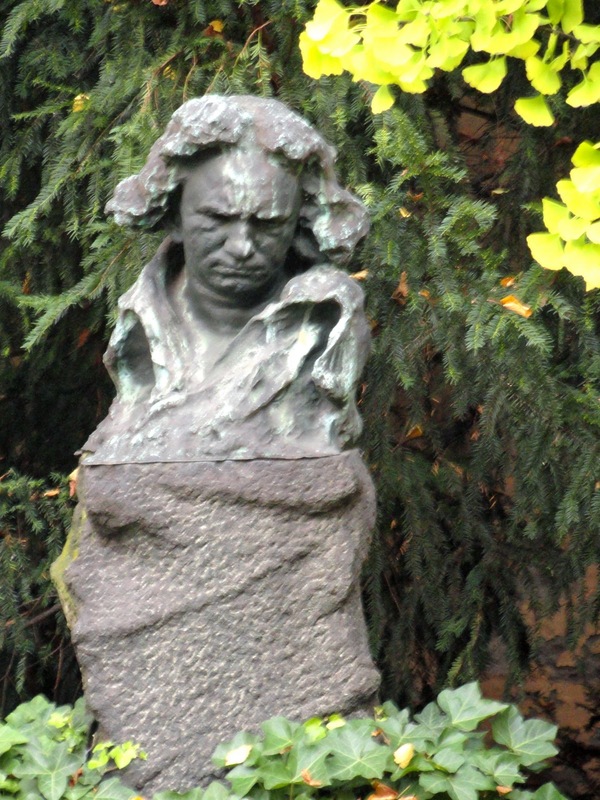 His father, a singer and alcoholic, lost his voice from drink and decided early on that his son Ludwig would be a musical prodigy. 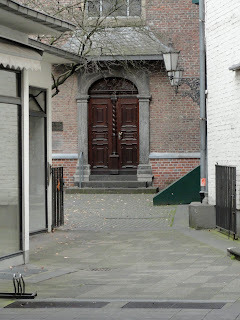 The small house (no photos allowed) contains his last two piano fortes, his viola, the largest collection of his manuscripts and a variety of ear trumpets (he was deaf by 30) in addition to his death mask and wisps of his hair. When Beethoven died from lead poisoning at the age of 57, more than 30,000 people attended his funeral a mere three days later. Warning: You'll go up two flights of narrow, twisting stairs. If it is too much, stay in the street level gift shop and listen to some of his glorious music. to the Rhine and our appropriately named boat, Beethoven. 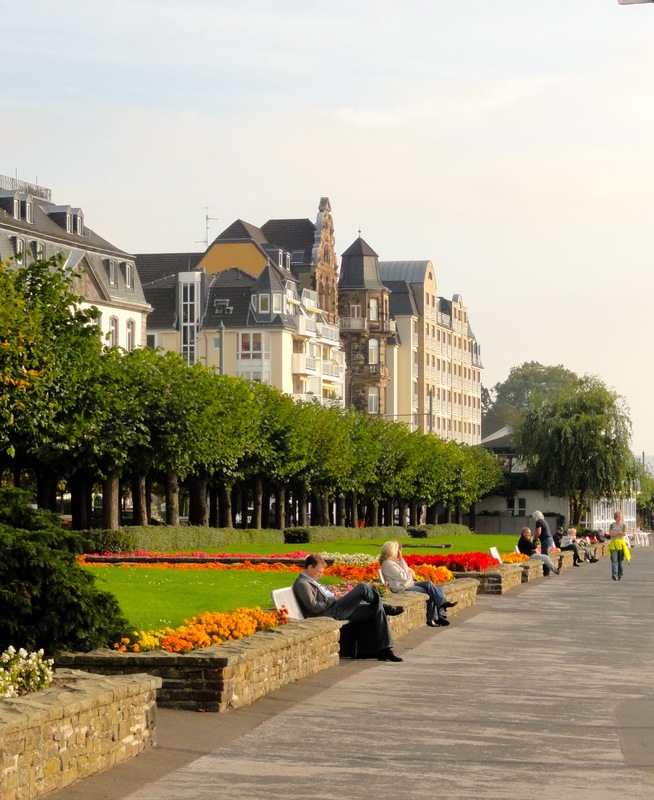 Bonn now has a place on my bucket list as a place to return. 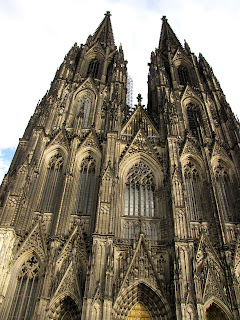 The Romans knew it as Colonia, the Germans know it as Koln, Americans know it as Cologne. 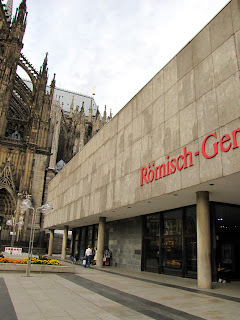 By these and any other names, it is a beautiful city on the Rhine, full of good art, a beautiful cathedral, good beer and great fun. One of Germany's oldest cities, by the Middle Ages it was the most densely populated and most prosperous in the German-speaking region. I didn't see nearly enough of it, but Levelers will like it because it's flat. Romans established Colonia in 50 AD and it soon became one of the most influential trading centers in the Roman Empire. 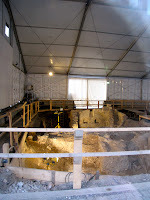 You can see the best of Roman artifacts - every time they dig down somewhere more are found in Romisch-Germanisches Museum, just to the right of the cathedral. You can't miss the cathedral - its Gothic spires tower over the city. That they do is a miracle. Cathedrals traditionally took a long time to build but Cologne's seemed to take so long that residents had a saying: "As soon as the cathedral is being completed there will be the end of the world." Places of Christian worship have been on its site since the 4th century and before that the Romans had structures here although probably not the temple claimed by guide books. Ruins of a Roman house were uncovered during the building of an adjacent parking garage. 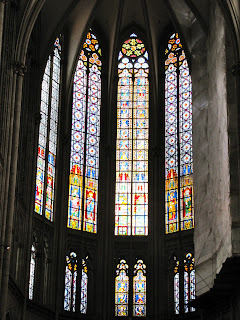 Tip: As you leave the cathedral, there is an elevator down to where you can look at the ruins through plate glass. Follow the sign to "toiletten" then to "Domturm Parkhaus". Better to do that than climb the 530-step spiral staircase to the tower although they tell me the view is spectacular. The cornerstone for the current cathedral was laid in 1248; plans were for a cathedral worthy of housing the skulls and robes of the Magi that Frederick Barbarossa brought from Milan following the crusades. 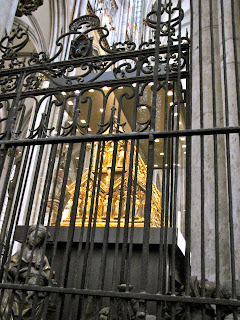 By 1517, the Reformation was underway, Vasco de Gama's discoveries were sending all the trade to Portugal and The Netherlands, the pope had his own cathedral to build in Rome (St. Peter's), Baroque style was all the rage and money had run out. Construction stopped. 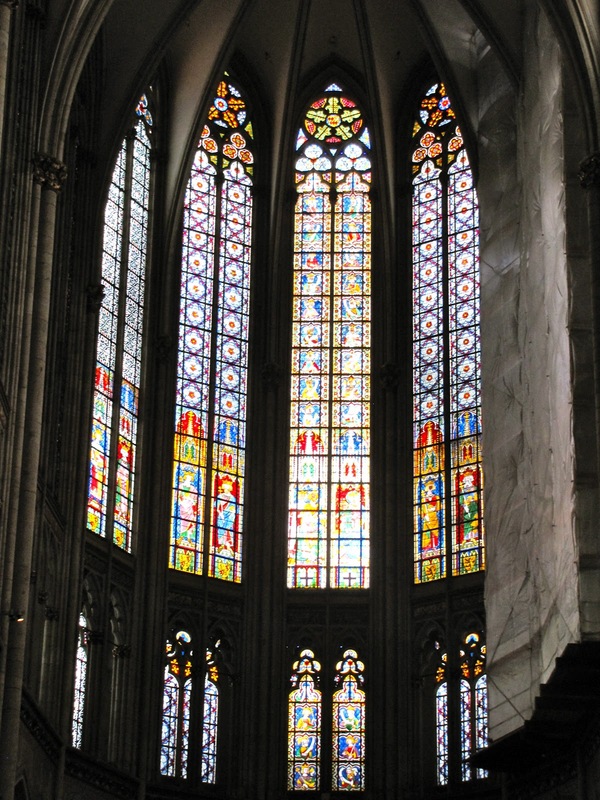 Around 1800, the Romantics had made Gothic architecture the rage and the Protestant Prussian kings decided to complete the cathedral. They did but don't worry about the world ending because of it. Work continues today, repairing the damage of World War II, the poor choice of original materials and today's pollution. 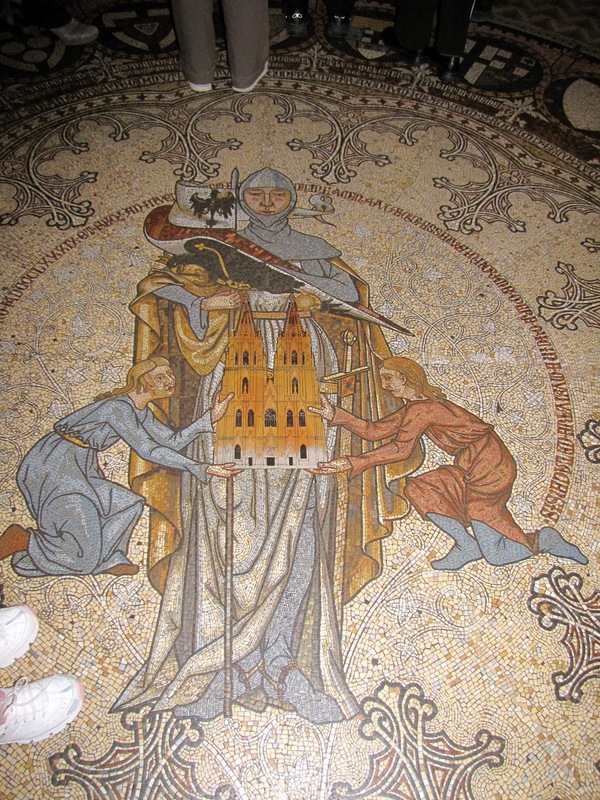 Inside, don't miss the mosaic on the floor - it's not tile but ceramic from the workshops of Villeroy and Boch. The 1442 Steffan Lochner triptych The Three Kings in the Chapel of the Virgin is a gem, but the real gems - 3,000 by official count - are in the gold Sarcophagus of the Magi behind the altar, said to be the largest reliquary in the western world. The wooden Gero Cross near the sacristy was carved in 976 and is the oldest surviving large crucifix north of the Alps. 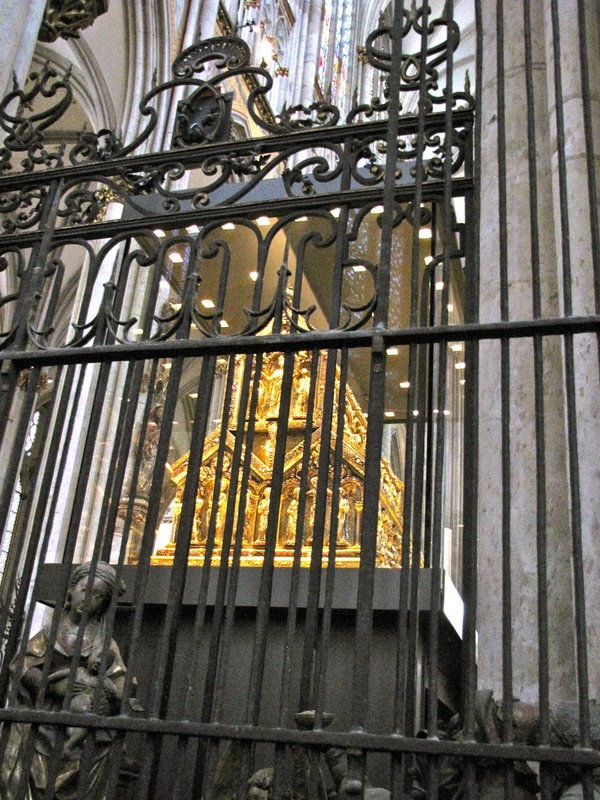 Surprise: In 1670 the choirmaster handed out sugar sticks bent like shepherds' crooks. The first candy canes? 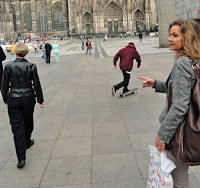 Tip: Do take a walking tour of Cologne if you can; it's flat and fun, especially the one on Cologne females. 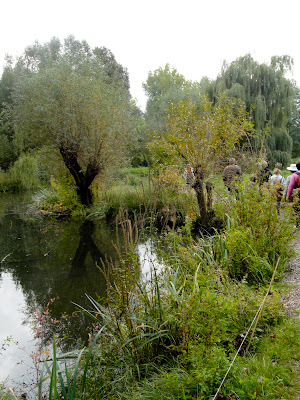 There are a lot of surprises, too, that you'd never notice without a guide. Art-wise, the Museum Ludwig is a not-to-be-missed. Its collection of 20th century and contemporary art is sublime, including the most significant collection of Pop Art outside the U.S., the world's third largest collection of Picassos covering all of his periods and genres and one of the world's largest collections of Russian avant-garde works. Tip: Use the elevators, Levelers, and grab a folding chair to sit on when you tire, but do not miss this. 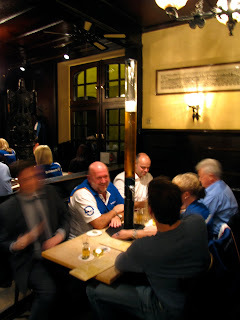 When the sun is over the yardarm and your tummy begins to grumble, make a beeline to the brewpub Suenner im Walfisch and hoist a Kolch beer (there are 24 brands; we had sunner). 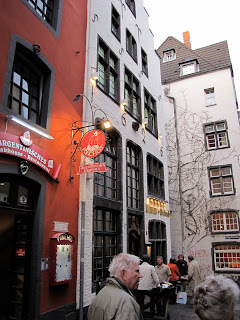 The building dates from the Middle Ages, the clientele is native Kolners and the food is excellent. Finish your repast with an akrobar, a digestif that used to be an ancient medicine. You will have overeaten and it will settle your stomach. Warning: The bathroom is up a winding staircase if you are seated on the ground floor. March may have its Ides, but for travel lovers, this November has it's 20th because at 10 p.m. that day the bidding ends in the Society of American Travel Writers' annual Travel Auction. Current top bid on a $4,422 four-night luxury Bali getaway is $400. Current top bid on two nights each at the Fairmont Banff Springs with breakfast and spa access and at the Fairmont Chateau Lake Louise in the glorious Canadian Rockies, value $2,500, is $450. Then there's the family package - 2 adults, 2 children 12 and under - at the Gran Caribe Cancun: three nights, four days, meals and for adults, alcohol included, an $800 value with a current bid of $150. Other packages include golf getaways, city escapes and ski vacations closer to home. Go to www.satwauction.com and start the bidding. Near Neuss, a pleasant drive southwest from Duesseldorf, art is housed in art atop a former NATO missile base. 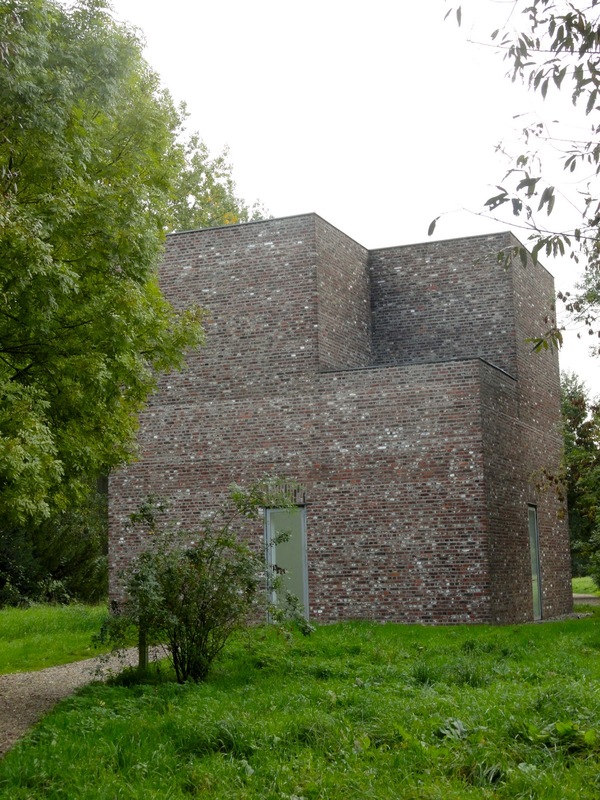 The Langen Foundation, the private endeavor of art collectors Marianne and Victor Langen, is one of those places you have to know where it is to get there. Understandably so, considering it housed Pershing and Cruise missiles until 1994. During my visit in October, its nearest neighbor was a field planted with kohlrabi. Japanese architect Tadao Ando transformed the space with a building he was commissioned to design, not for any specific purpose, according to our artist/guide Jens Stittgen, but to be a memorable space that could hold things. It is, from the walkway lined on one side with Japanese cherry trees to the smooth as silk special concrete - pumped up not down - of the building. Inside, the special exhibit was a mixture of Belgian, ZERO Group painter Jef Verheyen's light-filled work and Japanese art and objects from the Langens' collection. A long ramp and stairs lead down to a gallery of more contemporary work. Tip: The stairs aren't bad, but I recommend the ramp. 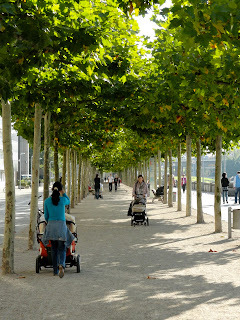 Nearby, Museum Island Holmbroich is a revelation of another kind. Duesseldorf collector Karl-Heinrich Muller with the help of painter Gotthard Graubner developed the display concept to follow Cezanne's dictum, "Art alongside Nature." 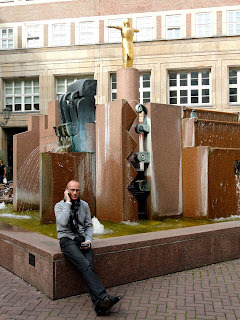 Muller bought an undeveloped hunk of land alongside the River Erft and had Duesseldorf sculptor Erwin Heerich create 12 walk-in sculptures, 11 of which contain art. 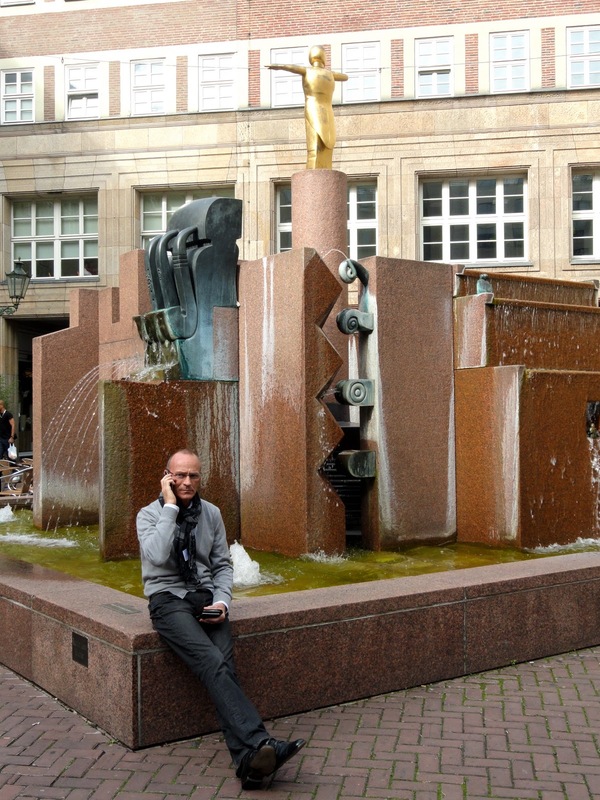 Many are themselves surrounded by sculpture. 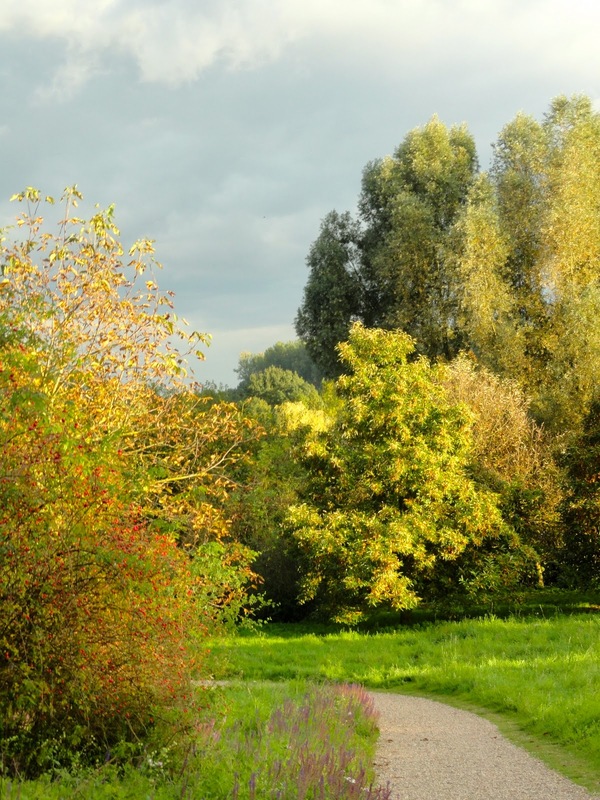 The result is a walk through the glorious works of nature with stops to gaze on the works of man, from the Chinese Han dynasty and native Micronesians to classical and contemporary European work. Warning: Levelers, you will have to walk over terrain with fairly gentle slopes, but to get to and from it there are formidable stairs - 45 steps that are steep and a bit slippery when wet. If you can manage them the experience is worth the effort. Neither chronology nor geography figure into Muller and Graubner's display concept, which is one of the more interesting aspects. Instead, complementary styles are combined. No commentary is provided, leaving it up to the viewer to find the parallels. For example, in one sculptural building you will find African sculpture paired with paintings by Karl Schwitters. However it is arranged, the art is well worth your time. In the works on paper building, I was delighted to find 17 Rembrandt etchings, two Matisses, a wall of Cezanne watercolors, and a handsome Gustave Klimt. It was late afternoon when we arrived to find our paths lined with meadow saffron, the tree leaves turning to match the autumnal weather, pairs of ducks paddling complacently around one pond and geese preening themselves alongside another. My visit wasn't nearly long enough. Plan to spend the better part of the day here. If the 12 euro weekday, 15 euro weekend rates seem excessive consider this: There is a cafeteria midway along your ambles where the food and drink are free with your admission! Have you been to either of these museums? What did you think of them? I'd love to know. 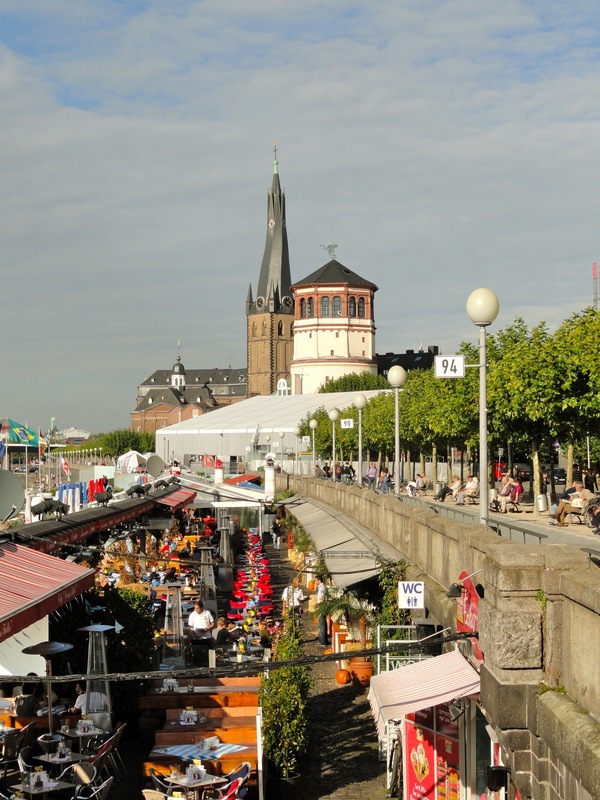 Duesseldorf has managed to preserve the charm of its old town, Alstadt, while redeveloping its Dussel River harbor with a combination of re-purposed and architecturally striking new buildings, making it the envy of other cities worldwide. 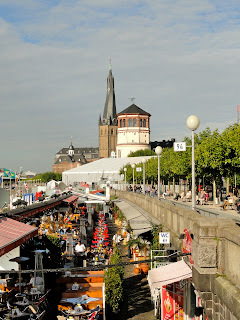 Beer, mustard, interesting art and architecture fronted by a river to the Rhine with high-end shopping and a quaint, pedestrian-only old town center where you will find 260 bars, restaurants and discos in one square kilometer; swaths of trees and green spaces and no hills to speak of - Levelers, what's not to like? Well, there is the construction for an underground subway system that no one seems to want, but dodging barricades and workers is a small price to pay. Prepare to walk. Public transportation is excellent but the only way to enjoy the old city is to walk through it and the best way to enjoy the beautiful riverfront and Media Harbor is to walk along it. There is a hop-on, hop-off tour if you can't manage the walking. Old town. 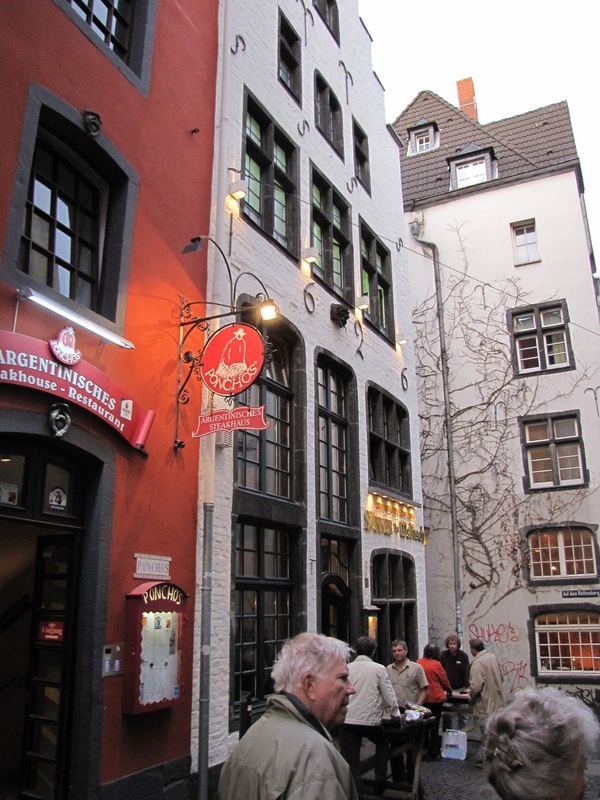 Cobblestones, brew pubs, quaint buildings, even a Mustard Museum are what you will find here. Also, Little Spain, a whole street of Spanish restaurants all owned by one man who came to the city as the child of guest workers. Many of his customers are Germans who winter in Majorca. The Mustard Museum isn't much - more shop than museum, but its array of flavored mustards is amazing. I came home with fig (!) mustard which is actually quite good. 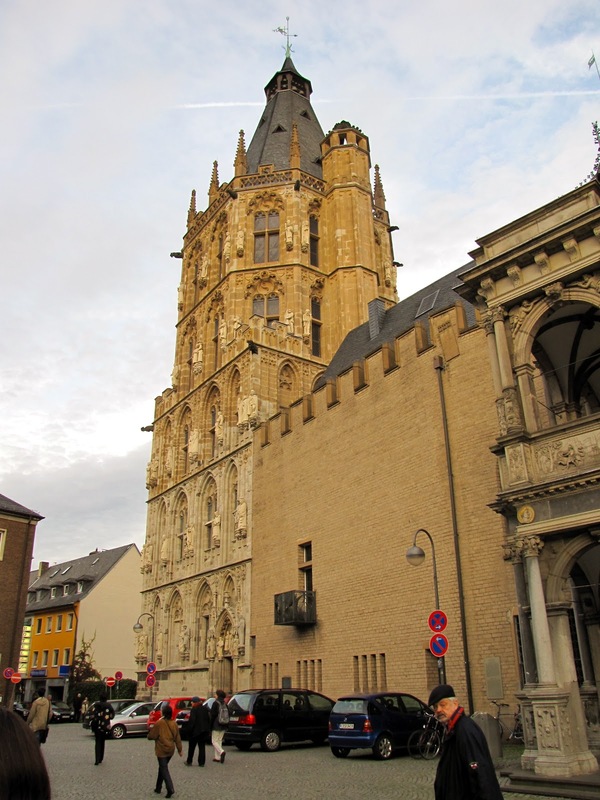 It's easy to miss the two remaining Protestant churches because they are set back from the street, a requirement in Catholic Germany at the time of the Reformation. It's impossible to miss the statue of Ioanni Guilielmo, Jan Wellem, John William, who ruled here in the 1700s and 1800s. 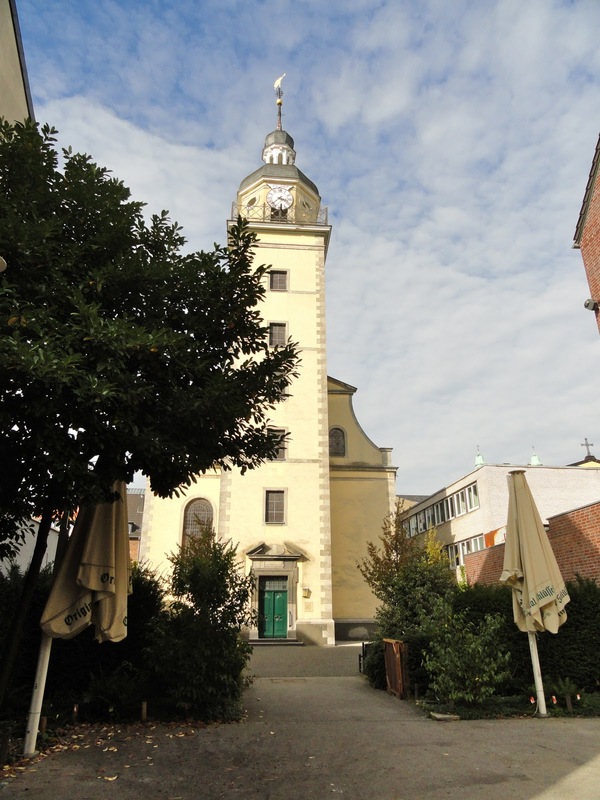 Not only did he set up the statue in front of Town Hall himself, he also allowed Protestants to build churches and the brewers to form a guild and thus come up with the city's famous Altbier, a pale ale with the dryness of a lager and the fruity notes of an ale. His favorite pub, now the popular traditional restaurant En De Canon, is next to the Karneval center, facing his statue. Speaking of Karneval, it is a major event in the city's social and party calendar. Like the Mardi Gras of New Orleans, it begins long before Fat Tuesday, but unlike New Orleans' celebration, women take the central role in Duesseldorf. 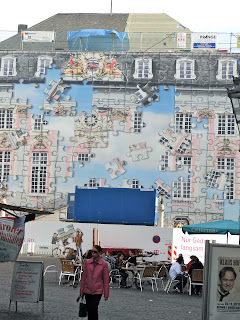 John William married one of the deMedici daughters and Duesseldorf soon became known as an art city. He was an avid collector; today the city's 26 museums span the history of art from ancient to yesterday. Its Art Academy has long been famous for artists and professors who welcome innovation. Among those you ought to see are K20 (modern) and K21(contemporary) Kunstsammlung, Kunst Palast and, if there's time, Kunst im Tunnel, literally, art in the tunnel, where students display their work in a no longer used tunnel along the waterfront. Another reason to stop there, its bathroom, down an elevator, is the most convenient to the harbor promenade. Tip: Relax, Levelers. The museums all have lifts. 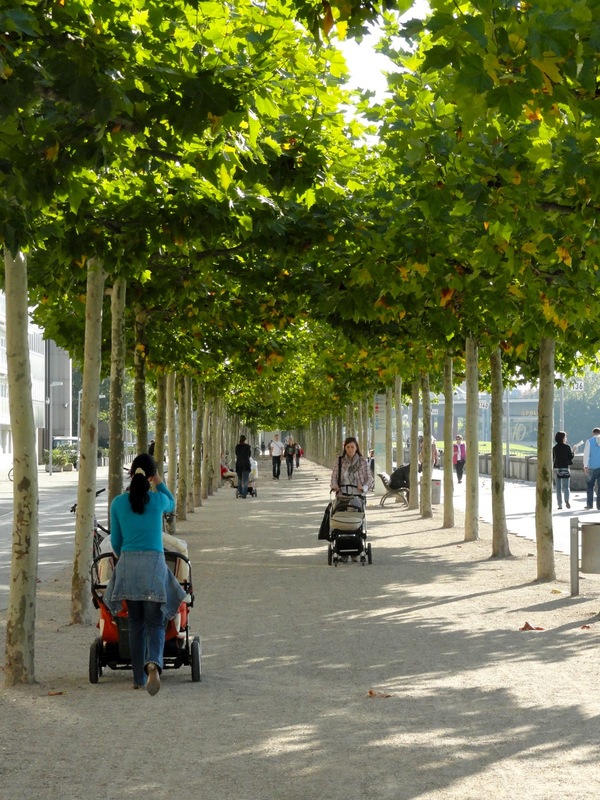 It's easy to see what a difference this artistic heritage has made to city planning. A ventilation pipe from the underground became the Music Fountain instead of an eyesore. 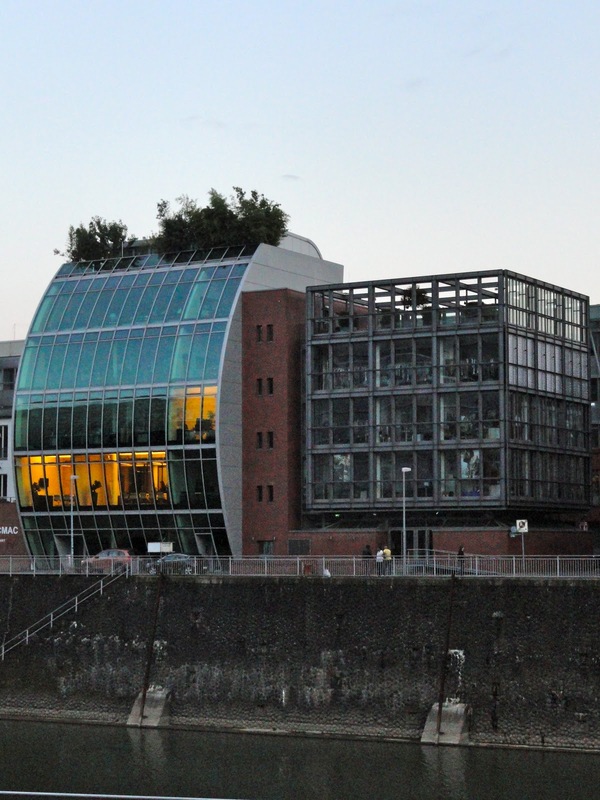 The harbor with its old storage buildings has been transformed into a hopping showcase of contemporary architecture with the river as inspiration known as Media Harbor. Frank Gehry designed three buildings and other architects include Doring Dahmen Joeresen, Steven Holl, David Chipperfield, Jurgen Schurmann, Zamp Kelp, Norbert Winkels, Claude Vasconi and a host of other, international innovators I should have heard of but haven't. Don't miss this; plan to see it in daylight and at night. You won't be sorry. In fact, you won't be sorry about anything in Duesseldorf except leaving. Where to stay. 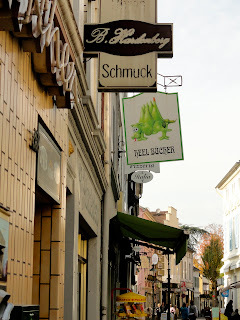 I was at Steigenberger Parkhotel, the city's first five-star hotel, which is at the beginning of Konigsallee, the "Ko," Duessseldorf's high-end shopping street, and a comfortable walk away from the old town. Warning: Because of the steep steps (about 8) up to the hotel I can't wholeheartedly recommend it for Levelers until 2013 when major renovations will have eliminated the steps. If you prefer the harbor area, Marriott, Radisson and Hyatt have hotels in the center of the lively bars, restaurants and businesses of Media Harbor. Where to eat. I can personally recommend Brauerei zum Schiffchen, the city's oldest restaurant (1628) and the only one where the bathrooms weren't up or down but on the same level (!). Very different but also very good is the chic Victorian Bistro, just off the Ko. And the duck in the Steigenberger Parkhotel restaurant is excellent. The potato soup at Julian's in the Courtyard Marriott is quite good too. I'll be posting the recipe for it on my other blog, Food Afar - Recipes from a Travel Writer.